Blushingly Blonde: Make-up routine and confession. Step 1. I usually use Derma v10 dry skin cream because I get dry skin regulary. (A pain, I know!) Though sometimes I use Baylis and Harding Sweet Manderin& Grapefruit body lotion. I only use this when I don't have dry skin because if I put it on dry patches it stings (SO BAD). I don't know why, I think it might just be the fragrance. Step 2. After that soaks in, I apply my foundation. For the summer time I use Laval Secret Beauty Foundation (Shade Fair 006). You may not of heard of the brand because it isn't well know. But this foundation is flawless and moistorizing. Step 3. The I apply concealer under my eyes and on any blemish's I may have. 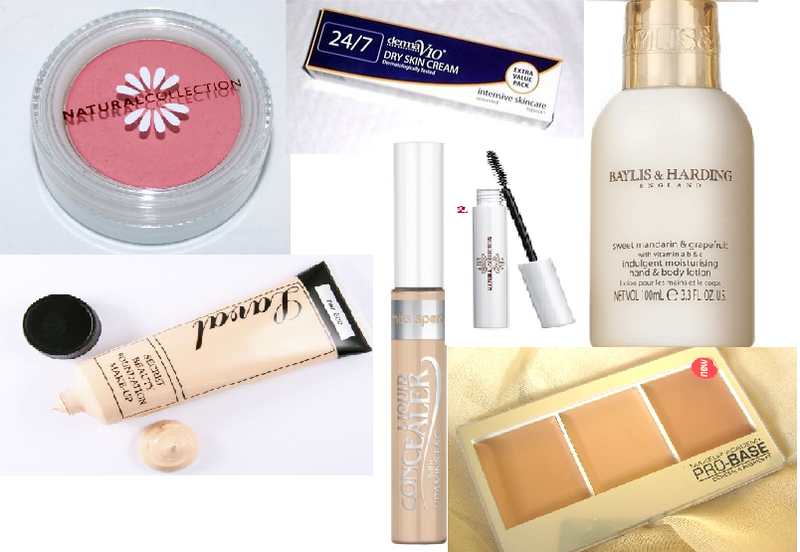 I use the Miss Sporty Liquid Concealer or MUA Conceal and Brighten Kit. Depending on how much coverage. Step 4. I then put over the top any transparent pressed powder I have to hand. My favorite is Lizzie Hide the shine pressed powder in Translusent. I love this because it makes my face so matte. Step 5. I then apply the Natural Collection Blushed cheeks in Pink Cloud. Step 6. I then apply eyeshadow. Mostly using my Pallette (I CAN'T REMEMBER THE NAME) and add any liquid eyeliner. And mascara. My favorite is Natural Collection Lash Length Mascara. But I hear the JORDANA Best Lash Extreme Volumizing Mascara. Is amazing. Does anybody use it?